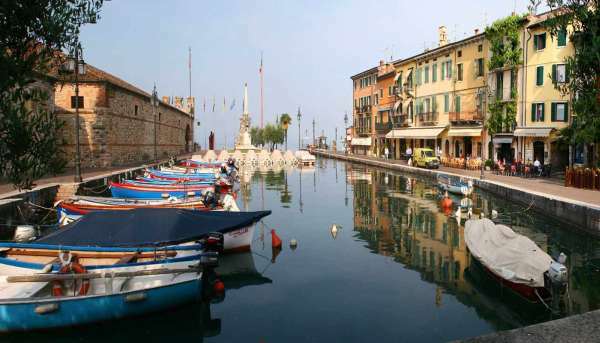 The town is very attractive with a lakeside walk decorated with colourful flowerbeds, the traditional fishing boats moored to the jetty, the old pastel-coloured buildings facing the lake, and the narrow alleys in the historical centre much frequented in all seasons. At Bardolino you can also visit two splendid ancient churches: Chiesa di S. Severo, a Romanesque parish church dating from the XI century, and Chiesa di S. Zeno, of even more ancient origin. The first contains precious frescos from the XI and XII centuries while the second, dating from the VIII century is a Latin cross structure supported by six red marble columns. As we mentioned, perhaps it is Bardolino wine that is famous throughout the world, so we cannot ignore the wine museum, Museo del Vino, not to be missed if you want a closer encounter with the wine and its history. Here you can see the ploughs, presses, decanting pumps, amphoras, and barrels used in the fields and cellars for producing the wine. The museum was founded by Cantine F.lli Zeni, situated on the hillside behind the town.